Breda the New Life Herald is a Nord lumberjack found at a tent south of Windhelm during the New Life Festival. She spreads knowledge of the Festival and how it is celebrated by the different races of Tamriel. She serves as both the giver of the New Life Festival repeatable quests and the person who you turn them in to. For each quest she explains the story behind that tradition, which race celebrates it, and where it is located. 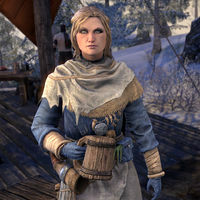 The New Life Herald is only a temporary position which was bestowed upon Breda, who travels on a pilgrimage every year from the Knotty Pines Lumber Mill to meet her festival friends in Eastmarch. She sends a barrel of mead back to her mill workers, which has led to accidents before. Well, perhaps not the Maormer - but everyone else. You should try it for yourself and see!" "Of course! They're different all over. I've taken part in cliff jumping, anchor tossing, and even drunken echatere racing... though Orsinium had to cancel that one. "Off you go. See the celebration for yourself!" "Local traditions are essential to the New Life. Sometimes they change, year to year!" "Everyone celebrates the New Life their own way. I do so love the variety." "You are curious about New Life traditions, aren't you?" "I am only a New Life Herald during the festival. Otherwise, I run a lumbermill." "The New Life is about what the old year was and what the new year can be." What's another way people celebrate the New Life Festival? "Once, very briefly, the city of Ebonheart decreed dancing to be illegal. The Dark Elves promptly invented the Lava Foot Stomp, which they called a necessity should their boots ever catch aflame. They practiced it in taverns, while wearing a small pin." "A dazzling pin such as this showed they were in friendly company. Now, it's a symbol of participation. Best to experience the Lava Foot Stomp for yourself. I'll mark the taverns on your map. Now, go forth and dance!" All right, I'll dance the Lava Foot Stomp. "You have the smell of soot about you! Did you just return from Ebonheart?" I completed the Lava Foot Stomp. "So you brought some much needed joy into the dour lands of Stonefalls? This is why the Lava Foot Stomp occurs each year. At least for a time, the warm feeling comes from within—and not all the nearby volcanoes." "You return, after quite the journey. No, don't tell me—I'll ask her when she visits." "The Orcs of Betnikh celebrate through the Stonetooth Bash—a constant party, not the repeated punching of faces. Though sometimes there is punching. Matron Borbuga is an old friend. Seek her out on Betnikh! She will show you." All right, I'll celebrate the Stonetooth Bash. "Welcome back! Did you enjoy your journey to the island of Betnikh?" I took part in the Stonetooth Bash. "Good food, good drink, and good times are the heart of Betnikh's celebration of the New Life. I'm glad Matron Borbuga could show you herself. I do miss the adventures we had in our younger days. I'd tell stories, but I don't want to burn your ears off." All right, I'll introduce them to Mud Ball Merriment. "Wonderful! Mud on the face reminds us that life is not always so self-important. With New Life comes a bit of fun, for those who aren't too proud to take part." "The Argonians of Hissmir have the Fish Boon Feast, one of Shadowfen's oldest celebrations. It's quite simple—those who are able, bring fish. Those who are not, eat fish." That sounds simple enough. What would I do? "Go fishing! Best to catch them in Shadowfen's waters—but if you hate to fish, you can still feed the hungry. Trade with friends, or seek them from a guild trader. When you have enough, deliver them to Gentle-Heart at Hissmir." All right, I'll help the Fish Boon Feast. "How was your trip to Shadowfen? Catch anything good?" I assisted the Fish Boon Feast. "The Fish Boon Feast reminds us that it warms the heart to fill a hungry belly, especially when it isn't your own. And if you're truly in need? Well … the smallest kindness of others can help you survive and thrive." "Redguards of Bergama have the Signal Fire Sprint. It honors an ancestor who saved their city from certain doom, a true gift of New Life. Go there, to the Alik'r Desert, and speak with Aubatha. She can explain!" All right, I'll head to Bergama. "Back from Bergama? I could never get used to the heat and sand." I completed the Signal Fire Sprint. "Ah, Zoreh's tale is a lovely one. Bergama's celebration honors the sacrifices we must sometimes make, so that others may enjoy a new dawn. A toast to your swift legs!" "The Nords of Lower Yorgrim celebrate by traveling to remote places, stripping down to smallclothes, and leaping into the freezing water. "The Bretons of Alcaire Castle have a curious tradition called the Castle Charm Challenge. Long ago, after a terrible war, the steward declared a contest. Any performer who most delighted the castle's survivors would win great renown." "Here, everything in this performance kit will let you experience for yourself. Go to Alcaire Castle in Stormhaven and perform for the crowds. They're quite friendly, so don't fear your time in front of them!" All right, I'll take part in the Castle Charm Challenge. "I hope you enjoyed your time at Alcaire Castle. A shame I did not see for myself!" I completed the Castle Charm Challenge. "Then you know its importance to Alcaire Castle. Imagine a castle recovering from a terribly bloody war. Parents lost, siblings scarred, children buried. After such tragedy, they celebrate the New Life as a chance to laugh and wonder once more." Meet This Year's Officiate - Breda, a letter from Breda to her fellow mill workers giving background on the New Life Festival and opponents to it, was released on the official site before the 2016 festival took place. This page was last modified on 17 December 2018, at 00:13.